Somewhere along the lines I lost my taste for big, doughy pizza crust. My pizza became all about the toppings and the crust, as long as it was crispy, became a great accompaniment. 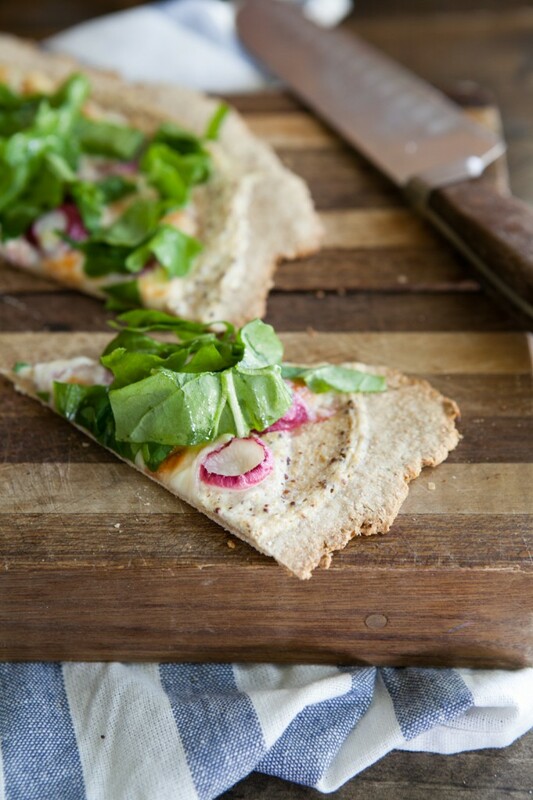 When I saw amazing looking Whole Wheat Cracker Crust on Sarah’s blog, I knew I had to try it. No yeast, super fast and amazingly crisp. What else could I ask for? I’ve also been thinking about this pizza for awhile. I really love roasted radishes. 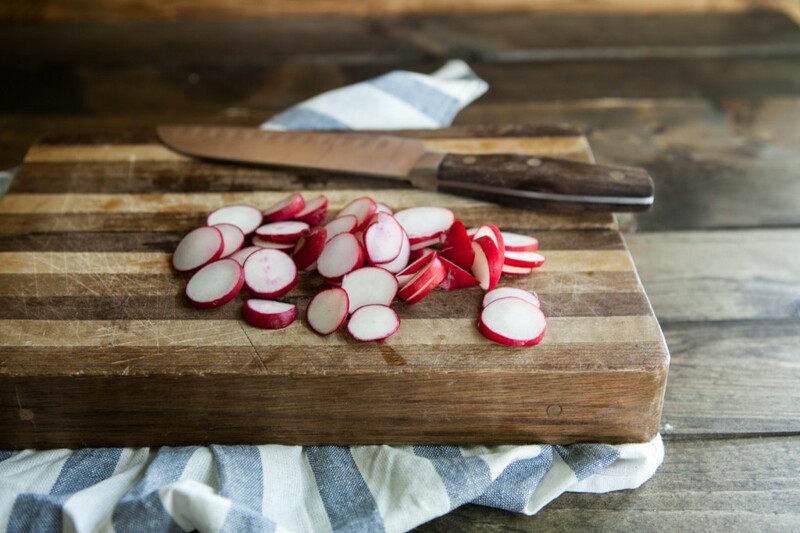 The major bite of the radish is tamed and turned in to this great earthy sweetness when a radish is roasted. I added the mustard to bring a bit of the bite back in but you are more than welcome to leave it out- this pizza would be equally delicious! I think a few herbs thrown in to the ricotta would make for a nice companion as well. The cheese could also be changed a bit. I went for the tame mozzarella but I think some goat cheese or gorgonzola would me amazing. Maybe with a little honey drizzled on top? Really the options are open, just don’t leave off the roasted radishes. 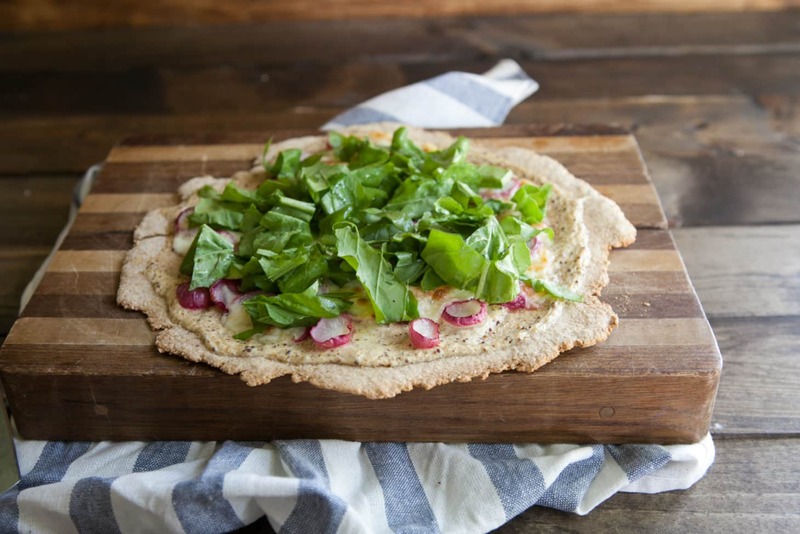 Even if you don’t try this pizza, I urge you to throw some radishes in the oven (tossed with a bit of olive oil, salt, and pepper of course!) I think you will really love them! We are coming up to the season, at least in Illinois, where radishes are bountiful and I can only eat so many raw! 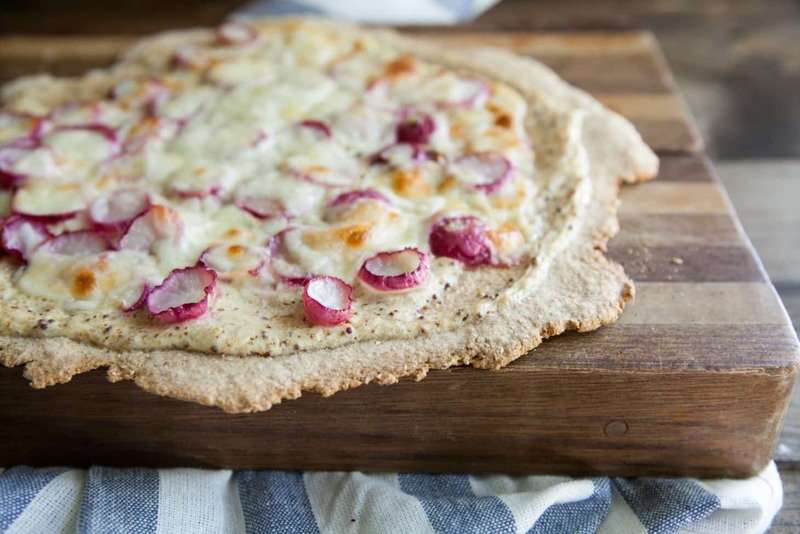 I would never have thought of putting roasted radishes on a pizza but I’m totally in love with the idea. I lost my appetite for “big, doughy pizza crust” too. Actually, I don’t think I ever had it. This creation is both beautiful and tasty, well done!. This looks so good! I’ve always avoided radishes [I had a bad experience with one], but you may have convinced me to try again. Did you like the honey in the crust? I’ve thought of swapping out the sugar for the honey, but haven’t tried it yet. I lost my taste for doughy crust in grade school. Gotta love a good thin crust. NY style or cracker crust will do! Roasted radishes? Hmmm! Why have I never tried that!? Sounds great! Mustard Ricotta sounds like a great base for a pizza. SO much flavour. Roasted Radishes are seriously some of my favorites! Okay… so I just asked Kathryne when she was going to write her creative cocktail book, now I’m going to ask you, when are you going to write your creative pizza book? Holy moses, lady. You are the pizza queen. Love this. i cannot wait to give this crust a try!!! This looks really good. I’ll have to make some rinotta and give it a try. ooh! I love roasted radishes too! I think I discovered them last year and haven’t eaten a raw radish since. I haven’t tried them on pizza, though! This crunchy crust with creamy cheese and sweet radishes sounds like a perfect spring dinner. I’m always looking for fast pizza crust recipes. I have one of these in the oven right now. I added basil, stuck with the original crust and made the tofu ricotta from 500 Vegan Recipes. I’m really excited to try this! Looks like a formatting problem on your ingredients list–1/2 c ww pastry flour AND 1/2 c AP flour, yes?